You come back home on a cold winter evening after a long trip and the key cannot get inside the lock. Is it possible for the lockset to be broken? Yes, there is such a possibility, but if the door is firmly closed, it is much more likely for the lock to be frozen. Learn more about this common issue and about the right lock fix in this kind of situation. Here you will also find advice on how to prevent this problem from occurring. Several conditions must be present for freezing to occur. When the temperature outside is low, the external part of a front door lock naturally becomes colder while the internal section is warmer. Condensation occurs and the tiny drops of water inside get easily frozen. 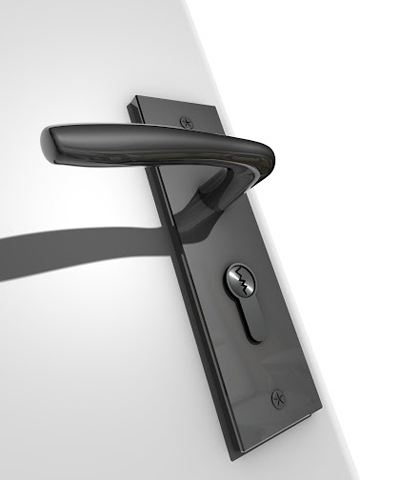 In general, the lower temperature makes it difficult for the internal components of a lock to move. That is why some people can still insert their key inside, but find it impossible to turn it. One important thing to note is that the physical locks of vehicles left outside are at the highest risk of freezing. When you have to deal with a frozen lock, the most important rule is not to use any sharp and thin object to break the ice. This poses a huge risk of damage to the cylinder. In such cases, lock repair may not be sufficient for resolving the problem and the damaged device will have to be replaced. There are completely safe and much more effective methods to use instead. You can apply de-icer into the lock directly. This compound will melt the ice and you will be able to use the door lock just like before. If you do not have this kind of product at hand, you can rub the lockset with alcohol and try to squeeze a few drops inside the keyway. Then you need to add lubricant into the keyway and on the key and try to unlock the door. You can also apply heat to the lock using a heat gun or a hair dryer. Heat the device only for a little to avoid damage. Touch it with gloves as metal can get very hot. Freezing can be prevented with regular maintenance. Before the winter comes, you need to clean and lubricate all exterior locksets. In general, it is important to examine them beforehand. Damaged devices have to be fixed while extensively worn and outdated ones should be replaced. With timely lock change, you will automatically reduce the risk of someone breaking into your house through the door to the possible minimum. With proper care, you should not worry about lock freezing. Still, it is a good idea to keep a de-icer at hand just to be on the safe side.